The Custom Redirects for WooCommerce plugin sets your WooCommerce products to redirect to a custom URL when added to a customer’s cart, or when purchased. This example redirect configuration would redirect a customer to a custom URL after they’ve added this product to their cart, and after purchasing. 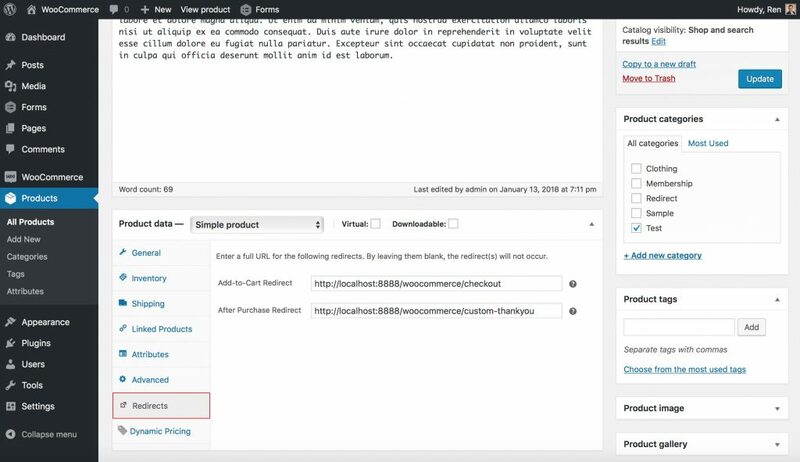 This plugin adds a tab to the Product Data meta box (Edit Product page). In the new tab, users (administrators or shop_managers) can enter a URL for various redirects (e.g. add-to-cart, and after-purchase). When these fields are set, the front-end user (customer) will be redirected to the URL when that the corresponding event occurs (when a product is added to the cart, or purchased). This can be useful if you want to automatically prompt your customers to purchase other products. The Pro version of Custom Redirects for WooCommerce supports Redirect URLs set from the product category and tag scope. The order of priority, from lowest to highest, is Category → Tag → Product. 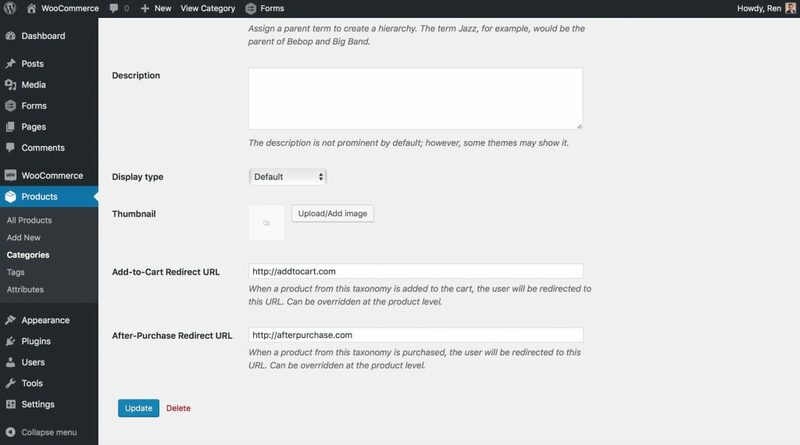 Product Category and Product Tag redirects can be added through the Category/Tag edit screen. You can add redirects for product categories and tags (taxonomies) by editing the taxonomy. You can also add a redirect when adding new categories/tags. Also available in the Pro version is support for AJAX add-to-cart on product archives. Allow your customers to add products to their cart without page reloads, but still redirect them if the product has a redirect URL set. The following features are available exclusively in the premium version of Custom Redirects for WooCommerce. 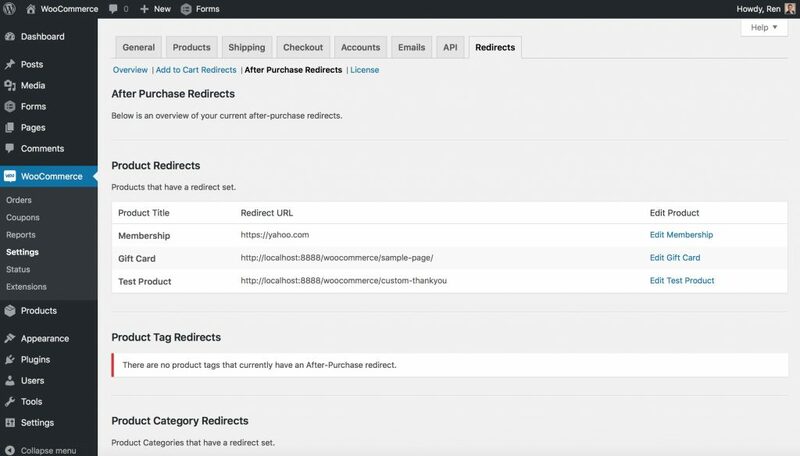 After-Purchase Redirects – Set a custom URL to redirect your customers after they’ve purchased specific products. Get super savvy with your upsells here by offering limited time discounts, or some other cool feature, for customers after they’ve purchased other products. Product Category/Tag Redirects – Instead of setting redirects for every individual product, you can simply set a redirect for an entire product category or tag. Redirect on AJAX Add-to-Cart – When AJAX add-to-cart is enabled in the WooCommerce settings, redirects will still occur. Support for Product CSV Import/Export – With the WooCommerce Product CSV Import plugin, you can quickly import and export products, and set their redirect URLs in bulk. Filtering products by Redirect URL – If your website has hundred, or even thousands, of products, finding products with a certain redirect URL could be a nightmare without a filter. No need to worry, this plugin has one! Quick Edit and Bulk Edit support – Redirect URLs can also be set for products using the native WordPress features of Bulk Edit and Quick Edit. Convenient admin page to see all your redirects – No need to keep flipping back and forth between products, categories, and tags. Custom Redirects for WooCommerce includes a useful overview page in the admin to see where all of your redirects are set, with links to edit them – no searching required! A sample overview showing a quick glance of where redirects are set. Give it a spin for free! The free version of Custom Redirects for WooCommerce is available on the WordPress.org plugin repository. Although it’s more limited in features than the Pro version, it still provides for setting add-to-cart redirects at the product level.